Ecobake's molds for muffinsáare manufactured on high-precision automated production lines, which provide a minimum size tolerance, making the moulds suitable for use on automated destackers. These baking moulds are made from non-stick, greaseproof paper, approved for direct foodácontact. Micro-perforated paper is available upon request. The base is made from non-stick, corrugated, micro-perforated paper, approved for direct food contact.The printing inks used can withstand high temperatures and spraying with preservatives. 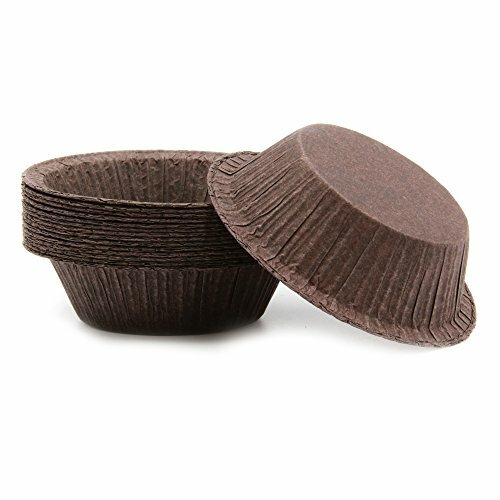 Moulds for muffins are self-supporting and do not require metal trays for baking. All Ecobake products are manufactured using recyclable and biodegradable paper. They thus safeguard the environment and comply with international regulations concerning direct food contact packaging. Ecobake uses carefully selected, highest quality raw materials in the manufacture of its products.Ecopack is UNI EN ISO 9001:2008 certified for Quality Management Systems and complies with European standards. It is also certified BRC (Issue 5) for Packaging and Packaging Materials. Products cooked in paper containers require lower cooking temperatures and shorter cooking times than aluminium. Furthermore, they require less handling than baking trays and allow products to be frozen/quick frozen if necessary. WITHSTAND HIGH TEMPERATURES UP TO 390 f :This is among the top benefits of baking paper. You can cook or bake your food at any temperate without worrying about the paper getting burnt. NON STICK GREASEPROOF PAPER: The paper is often used as a non-stick and disposable surface in most baking activities as well as other food preparation activities such as steaming. The baking paper comes in the form of flat or corrugated paper sheets. Here are a few common uses of baking paper Baking paper is used to line baking pans and cookie sheets to prevent baked products from sticking to the pans and cookie sheets. This use is beneficial because it eliminates the need to grease baking pans. If you have any questions about this product by Ecobake, contact us by completing and submitting the form below. If you are looking for a specif part number, please include it with your message.